For the past several years, the City Daily Photo bloggers have celebrated the New Year by exhibiting their best (or favorite) photograph of the year that has just ended. So, let’s do it again. OK? Jack from “Naples and Hartford in Season” has offered to show a favorite photograph with this announcement. Jack is a retired lawyer who began his CDP blog six days after his retirement in mid-2010. It was originally based in Hartford, Connecticut, but now Jack lives in the winter in Naples, Florida, so he posts from both cities – and wherever else he travels. This photograph is from an October trip to Italy. 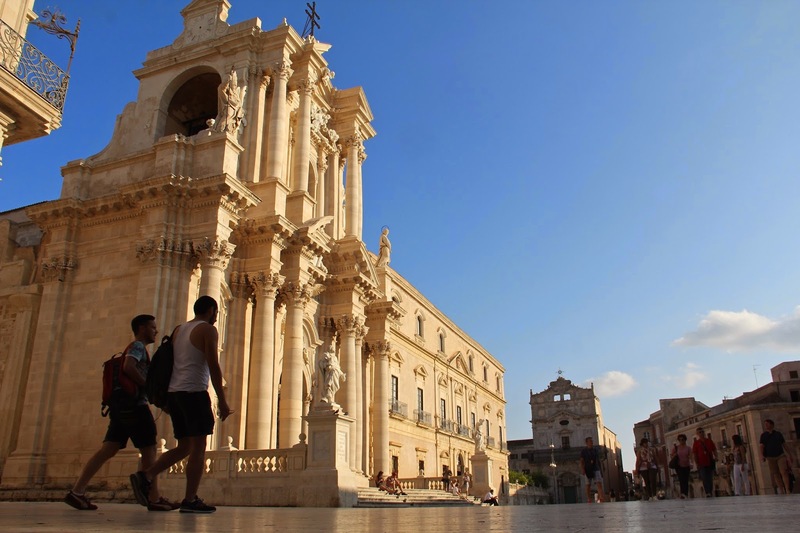 Siracusa is a beautiful old city on the southeastern coast of Sicily. Jack hung around the piazza in front of the Duomo and waited for someone to enter the scene from the left. These two young men cooperated. What will you show us on January 1? Thank you, everyone, and on this particular day especially to Eric, who made this group possible. May I echo the sentiments of Merisi. Many thanks to Eric for starting CDP, and for posting daily for nearly 10 years. May I wish him all the very best for 2015 in his new home in Malta. Many thanks also to Peter for hosting this Theme Day.